» PA-1002: The Future of Window Technology . . . Is Here! Windows and curtainwalls are ubiquitous building enclosure components. Like all parts of the building enclosure, they have to meet the fundamental functional requirements of support, control and finish (Straube& Burnett, 2005). They need to do all of this AND be transparent, thin, and in many cases, operable! It should be no surprise then, that windows and curtainwalls cost more per square foot than any other part of the enclosure. What designers often forget, however, is that these components perform their support and control functions at a level that is far below that of other opaque components: the fire, thermal, solar, impact and sound resistance are all very low. Modern aluminum curtainwalls and windows often have thermally broken frames, solar control and low-emissivity coatings on the glass, gas fills such as argon in the glazing space, and increasingly use insulating spacers. A combination of all of these technologies allows the u-value of the vision glass section of a curtainwall to reach a value of only around 0.3 to 0.4 (r-values of 2.5 to 3.0). It is difficult to achieve a whole-window r-value of even 4. Similarly, the percentage of solar heat gain that enters remains the same over the year, even though such heat gain is undesirable during warm weather and desirable in cold. Just as limiting is the fixed ratio of visual light transmittance to solar gain: whether it is dull or bright, the same proportion of light enters (see BSI-006 Can Highly Glazed Building Façades Be Green? at buildingscience.com). Major reductions in annual space conditioning and lighting energy (Carmody et al, 2004). Increasing the r-value and airtightness of walls and roofs to R20, 40 and even 60 is now well developed and can be deployed in almost all projects if desired (Straube & Smegal, 2009). 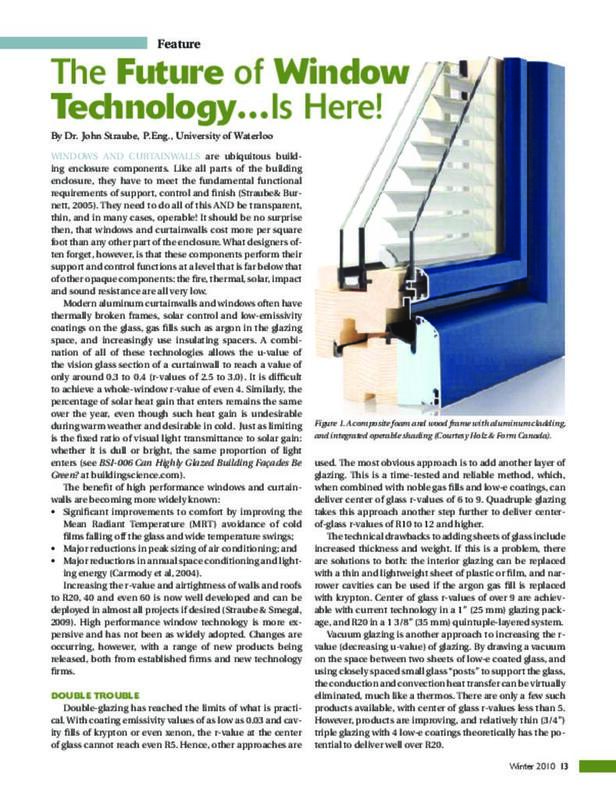 High performance window technology is more expensive and has not been as widely adopted. Changes are occurring, however, with a range of new products being released, both from established firms and new technology firms. Double-glazing has reached the limits of what is practical. With coating emissivity values of as low as 0.03 and cavity fills of krypton or even xenon, the r-value at the center-of-glass cannot reach even R5. Hence, other approaches are used. The most obvious approach is to add another layer of glazing. This is a time-tested and reliable method, which, when combined with noble gas fills and low-e coatings, can deliver center of glass r-values of 6 to 9. Quadruple glazing takes this approach another step further to deliver center-of-glass r-values of R10 to 12 and higher. The technical drawbacks to adding sheets of glass include increased thickness and weight. If this is a problem, there are solutions to both: the interior glazing can be replaced with a thin and lightweight sheet of plastic or film, and narrower cavities can be used if the argon gas fill is replaced with krypton. Center of glass r-values of over 9 are achievable with current technology in a 1” (25 mm) glazing package, and R20 in a 1-3/8” (35 mm) quintuple-layered system. Vacuum glazing is another approach to increasing the rvalue (decreasing u-value) of glazing. By drawing a vacuum on the space between two sheets of low-e coated glass, and using closely spaced small glass “posts” to support the glass, the conduction and convection heat transfer can be virtually eliminated, much like a thermos. There are only a few such products available, with center of glass r-values less than 5. However, products are improving, and relatively thin (3/4”) triple glazing with 4 low-e coatings theoretically has the potential to deliver well over R20. Figure 1: A composite foam and wood frame with aluminum cladding, and integrated operable shading (Courtesy Holz & Form Canada). Figure 2: Quad-pane high r-value glazing and insulated wood frames, with operable exterior shades. The limitation with all of the high r-value glazing technologies is heat lost through the spacers and the framing systems. Warm-edge spacers have become quite affordable and widely available, but most insulated glazing units (IGU) still have more heat lost through the spacers than center of glass. Much more significant is the heat loss through the frame. As high-performance glazing units deliver higher r-values, the heat loss of poor frames begins to dominate. In residential construction, a normal wood or vinyl frame may have an r-value of just 2 to 3. A commercial aluminum frame, even thermally broken, rarely has an r-value of better than 2. Hence, the energy-saving potential provided by multiple glazings, coatings and gas fills are bypassed by low-performance frames. This is a very significant penalty in practice: an R9 3’x5’ triple-glazed glazing unit in a standard thermallybroken aluminum frame can have a whole window thermal resistance of only R4. Frames of high-performance composite materials, commercially available as fiberglass frames, offer most of the strength, stiffness and durability of aluminum with the thermal performance of wood. Composite frames have been demonstrated in the lab and are becoming commercially available. This includes foam-filled vinyl frames with aluminum exterior claddings, wood frames with polyurethane foam thermal breaks (Figure 1), and slender foam-filled fiberglass extrusions with wood interior finish and aluminum outer weathered components. All of these offer the possibilities of R6 to R8 frames, and all are commercially available (or are close to being available). These frames still have more heat flow through them than very-high performance glazing, but can reduce heat flow by two to three times when compared to standard window frames. Aluminum window frames with thermal breaks over ½”, and up to 1” are available and can provide acceptable performance (e.g., R6 frames). Combining such large thermal breaks with non-conductive exterior pressure plates and filling the voids with materials such as aerogels can deliver frames with an r-value approaching R10, or 5 times as much as normal frames. The maximum rate of heat flow through a window does not occur on the coldest night of the year, but during sunny days. Of course, this heat flow is due to solar heat gain. The ratio of solar energy that becomes heat inside a building to that which falls on a window is defined as the Solar Heat Gain Coefficient (SHGC). Dark tinted windows and reflective coatings were used in the past to reduce the solar gain. However, these approaches significantly reduce the view and daylight. Modern windows use spectrally selective coatings which reduce solar gain with only a small effect on daylight. As impressive as spectrally selective coatings are, large windows will still allow very large amounts of heat to enter a building when exposed to direct sun. Windows in full shade can allow nearly half as much heat to enter as windows directly exposed to the sun. For well-insulated, airtight, low-energy buildings, even limited areas of low SHGC (e.g., 40 percent window to wall ratio in an office, with SHGC=0.33) can define the peak air conditioning load. At the same time, solar gain can be useful in cold weather, and daylight is usually welcome if it is not too intense. To allow solar heat and daylight through a window when needed (a high SHGC), and reject it more effectively when not (eg, a SHGC below 0.1) advanced technology is required (Selkowitz & Lee, 2004). Exterior shading, operated by automatic controls, can deliver this level of performance. For example, as the light intensity in the building reaches a predetermined threshold, the shades may deploy to fix the light level. If solar gain can be usefully harvested, the shades remain fully open, or pivot to bounce the light off the ceiling, thereby collecting the heat without glare. The same high-performance can be delivered without any visible shades through the use of electrochromic glazings. Several technologies are available, but ultra-thin thin coatings that change their tint when a small voltage is applied are now available. One product silently changes its SHGC from 0.48 to 0.09 in a few minutes with no moving parts. . .